Made with various scans of the manga. Used about 8 different scenes from the manga in this to make a collage. Brought it together with torn paper brushes, blood spatter brushes and coloring the blood in the scenes. I'm just linking a couple scans used since it would take more time and bandwidth than I'm willing to use uploading them all. I spent quite a lot of time working on this. Putting stuff in, taking things out. Just trying to get a nice balance and blend it nicely. And I agree. For being such an amazing series it sure gets overlooked a lot. I'm a massive fan and through my wallpaper work I hope to generate some interest and create more fans. Awesome wallpaper! 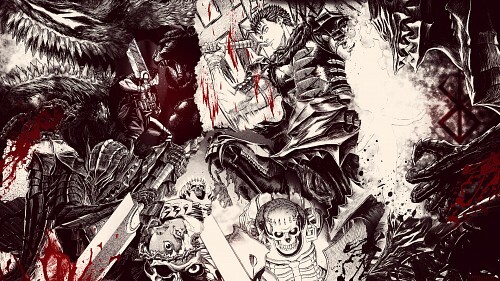 You don't really see any decent Berserk wallpapers but this one is cool! PS = When you reply to someones comment use "reply in guestbook" or else the person you're replying to won't see that you've replied.